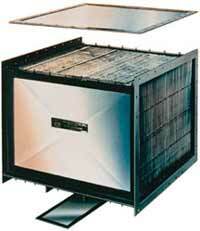 Exothermics - Heat Exchanger & Heat Recuperator - Buy HERE! Exothermics' World Class Heat Exchangers have been used in every industry that uses heat to process, dry, cure, bake, or finish their product. Exothermics heat exchangers, compactly built, are crafted from durable stainless steel, aluminum or other exotic alloys. The quality of these materials, coupled with sound, state-of-the-art welding and other innovative manufacturing techniques, is what makes the Exothermics unit so incredibly efficient, resilient and maintenance free. If you are in need of heat transfer equipment, heat recovery equipment, incinerators, or heat recuperators, Exothermics has a solution for you! Let Exothermics customize a heat exchanger for your application!